It’s no wonder that Hindu gods all have animals for celestial vehicles, or that many are part-animal themselves: India has an extraordinary range of habitats and biodiversity, and today, real-life holy elephants, monkeys, peacocks and bulls roam the country as they did in the time of the ancient scriptures. The numbers are down, of course – by a lot – due to poaching and human sprawl. Just a hundred years ago, India had about 100,000 tigers; today only 1500 are left in the wild. But that’s still about half the world’s tiger population, and despite the many threats to animals and their habitats, India’s wildlife scene remains rich and diverse. The country ranks ninth in the world for mammals, with 412 species, and it has 12% of the planet’s fish and birds. Conservation has been boosted in recent years – in part because of the value of wildlife tourism – and India now has almost 500 wildlife sanctuaries, 100 national parks and 14 biosphere reserves, making it easy to see at least some of the country’s animal kingdom on your trip. Tigers: in an effort to protect the endangered cat, in July 2012 the Supreme Court passed a ban on tourism in the ‘core areas’ (but not the ‘buffer zones’) of the country’s tiger reserves. The ban is controversial and may not last; check parks in advance. Assuming you can get in, Karnataka has about 300 tigers – the most of any Indian state – in its six tiger reserves. Try your luck at Bandipur National Park. 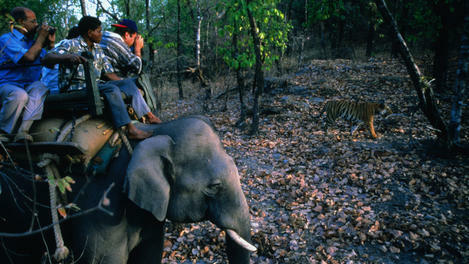 Madhya Pradesh has India’s second-highest tiger population, but its Bandhavgarh National Park has India’s highest tiger density; sightings here, as well as at nearby Kanha National Park, are almost guaranteed. Elephants: India used to be just swarming with them, but now Indian elephants are concentrated in a few pockets around the country. The Nilgiri Hills, at the southern end of the 1600km-long Western Ghats mountain range, has the most (about 10,000). See them at the Nilgiri Biosphere Reserve, which comprises four protected areas across three states. Wayanad Wildlife Sanctuary, mostly in Kerala, is undervisited, gorgeous, and full of elephants. Mudumalai National Park, in Tamil Nadu, as well as Nagarhole and Bandipur parks (both entered from Karnataka) also have large populations. Leopards, lions and other fun mammals: in addition to tigers, Bandhavgarh has some 40 leopards, along with nilgais (a large, adorable antelope), sambar deer and – wait for it – porcupines. Govind Wildlife Sanctuary & National Park in Uttarakhand has black and brown bears, as well as the elusive snow leopard. And the world’s last 400 Asiatic lions live in Gujarat’s Sasan Gir Wildlife Sanctuary: the refuge has been so successful that it’s no longer big enough for the growing lion population . You have a 50/50 shot of spotting one on a morning safari. Rhinos: the status of the one-horned rhino recently moved from endangered to vulnerable (yay!). But poachers still like the horns, and there are fewer than 3000 of them in the world today, two-thirds of which live in Assam’s Kaziranga National Park. Spot them from atop an elephant on safari. Birds: India has some exotic specimens right in the middle of its cities (Bangalore and Mumbai both have excellent bird-watching clubs), but serious twitchers can see flamingos and other wetland birds at Gujarat’s Nal Sarovar Bird Sanctuary. Keoladeo Ghana National Park in Rajasthan is a spectacular pit stop for migrating birds: bicycle around in season to see sunbirds, parakeets and magpies. Down south, Vedantangal Bird Sanctuary in Tamil Nadu has lake and forest birds, including cormorants, herons, storks and ibises, as does the Ranganathittu Bird Sanctuary in Karnataka. Some parks and reserves have restrictions on the types of vehicles that can enter. You’ll want a small, quiet 4WD, preferably with open sides (good for animal-spotting) and a covered top (to block the sun). Both buses and cars or autorickshaws are limited on rugged roads because they’re too big and too small, respectively. Guides, including mandatory ones that some parks send with you, may not be knowledgeable; try to arrange for a good one in advance. Bring sunscreen, binoculars, clothes in a muted colour and most of all, your quiet voice! Get inspired before you go by the zillions of photos of Indian creatures at www.indianaturewatch.net. For the big mammals, come early in the year, when the weather has been dry for a few months: the foliage is thinner then, and animals are forced to come into the open to find water. Weather patterns vary across the country, but in most states, March to May is prime. Birding tends to be best from October to February. Check the details for each park to figure out peak safari season. love to visit these places.